“They may take our lives, but they will never take our currency” has been the tone many have taken over the last few days where matters of the currency union were being discussed. 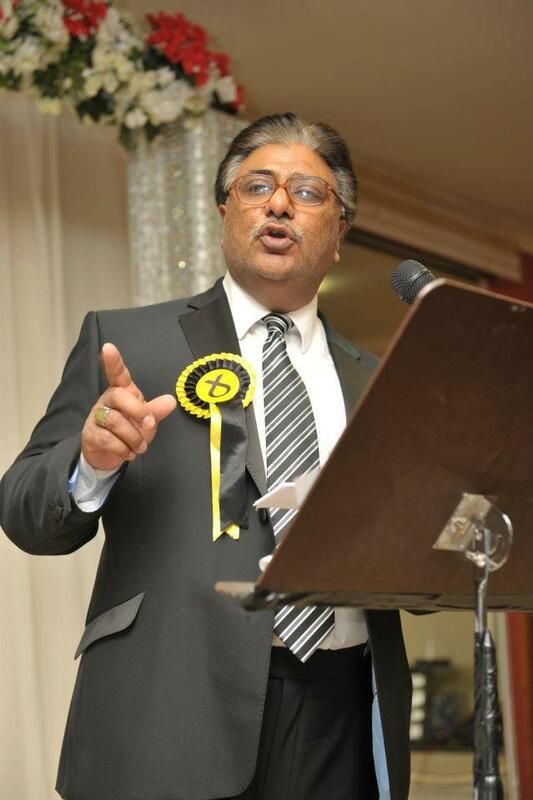 Councillor Shabbar Jaffri shares his views on the latest developments. The coordinated offensive led by George Osborne on the 13th of February on behalf of the Unionist Company Limited reveals his sheer lack of diplomacy. I wouldn’t be surprised if he thinks the art of negotiation is a painting hanging on the walls of the Tate. I am sure the UK Government’s unwarranted action has arisen out of panic, confusion and lack of vision or strategy. It has everything to do with being scared of the fact that polls of recent are showing support for independence is on the rise. And it has probably been concluded that it will continue rising. Thus this fact alone is the catalyst which has forced the Chancellor to play his ace so urgently, as if to immediately quell the possibility of a mass uprising! The issue of the currency union is by far one of the most important ones to embrace the debate and the whole question of independence, though the sharing of assets and liabilities is not too behind in the league of important issues, and also inter-connected to the overall content of negotiations over independence; before and after. The refusal by the Chancellor to “permit” Scotland the continued usage of the sterling under a shared currency agreement is a stark reminder of the false promise made by Westminster, in particular by the Prime Minster himself, that it will not pre-negotiate the break-up of the Union. I cannot imagine a more serious and important factor than that of the currency to cite as a perfect example for him to adopt for the pre-negotiations to commence. However, no matter how undiplomatic and unwise the Chancellor has acted, it must be noted, that it is his action which has opened the door to protracted negotiations which must now sadly take place in this unprofessional manner. Obviously Mr Cameron didn’t quite achieve the effect he was hoping for when he decided to play Mark Carney (in fact his appearance on the Scottish currency scene turned out to be an own goal) or Bob Dudley CEO of BP. Osborne’s “hard bargaining” position has begun far too high. It has revealed his hand too soon. This was his ultimate weapon. However, as we shall no doubt be able to witness in the coming months he will have to subdue his position by accepting a compromise which will prove both very difficult and embarrassing for him and David Cameron. Therefore the Scottish government reserves the right to respond with a counter offer. The counter offer can be quite legitimately Scotland’s refusal to take a share of the UK’s debt. With Scotland being a brand new entity it cannot be held in default as it held no contractual capacity to legally incur any debt whilst it was a part of the old UK. Legally speaking, therefore, the creditors of UK plc would only be able to pursue Westminster governments and not Scotland. The benefits to Scotland from that debt become merely political arguments, but definitely not the makings of a legal case. Further, Scotland could also counter argue the benefits derived by the rest of the UK from its vast oil and gas revenues over the past years should be returned in equal measure of compensation and kind. This perspective can be our entry into the protracted negotiations. As far as our assets are concerned, in particular our natural assets like gas and oil, well they go with the territory. Our rights of possession are fully enshrined in law. When the extent of the value of trade and services between the UK and Scotland is £60 Billion per year it would be sheer madness of UK plc. to even contemplate sacrificing this huge mutual benefit by attempting to jeopardise the Scottish economy as it would also affect its own economy, to a much larger proportion. The point here is, regardless of the creation of a currency union or not, our economies as neighbours are very closely related, enjoying a fantastic environment and infrastructure in which they operate and trade from. Therefore it is to our mutual interest and benefit to assist and support the respective economies. Anything else would be financial suicide. It is a very hypocritical and condescending of the Chancellor to have adopted such a scaremongering position motivated by selfish interests of preserving the elitists in the power houses of Westminster and Whitehall, happily maintaining the status quo from generation to generation, establishing the establishment, stopping at nothing to keep Scotland subjected to their rule whilst quietly squandering its oil billions on illegal wars and such likes. Hypocritical, because if the UK can value the importance and significance of Ireland’s economy in terms of the benefits to its own economy then it should be able to apply the same sense of importance and significance to the Scottish economy too. Like the Irish economy the UK needs the Scottish economy just as equally. Both economies are almost identical. Yet why was it when Eire got into financial problems, not too long ago, the UK was quick to bail it out with UK taxpayers’ money despite there being no legal obligation or agreement forcing or requiring the UK to pour in billions into the Irish economy to aid its recovery? Ireland was and remains the UK’s biggest export market, with no Irish market the second casualty after Ireland itself would have been the UK. It was cheaper to bail the Irish out rather than the pay the full price at home! And Ireland doesn’t even use the Sterling nor have a currency union with the UK. And geographically speaking its cheaper and quicker getting UK and Scottish goods and services to and fro as we don’t have the inconvenience of a great big puddle between our suppliers and customers! Whilst we are discussing the Irish, you may want to know that after Ireland won its independence its share of the debt was written off-in full. Why? Well for the same rationale as aforementioned in the bailout scenario; it was considered cheaper to do that because…wait for it-because it was important to assist Ireland grow its economy as it had a direct impact on UK’s own economy. The long and short of it is the potential loss of revenues from the combined production of our oil and gas which equates to about £14 Billion a year is causing Westminster severe pain. The thought of not being able to rely on that revenue is, well, just too hard to bear. Therefore, the UK and its Chancellor are going to do everything possible to ensure they don’t lose this huge sum of money, are they not? The stance being adopted by the No Camp needs to be brought in line though. It is morally, politically and even possibly legally wrong of them to participate in the debate in the manner and style they have chosen to about independence especially concerning the sensitive issues such as the one about the currency. They are exploiting public sentiment by discussing these issues piecemeal and inconclusively, deliberately trying to mislead voters. It can cause uncertainty in our home markets and amongst businesses. Churning out false information and political propaganda can never help people understand either the benefits or the implications. The Electoral Commission must intervene by sending out a strong warning to the Unionists and their allies that such behaviour must cease immediately. I implore on the Scottish Government to call upon the Electoral Commission asking it to provide guidance to the No Campaign to conduct their campaign truthfully and honestly. 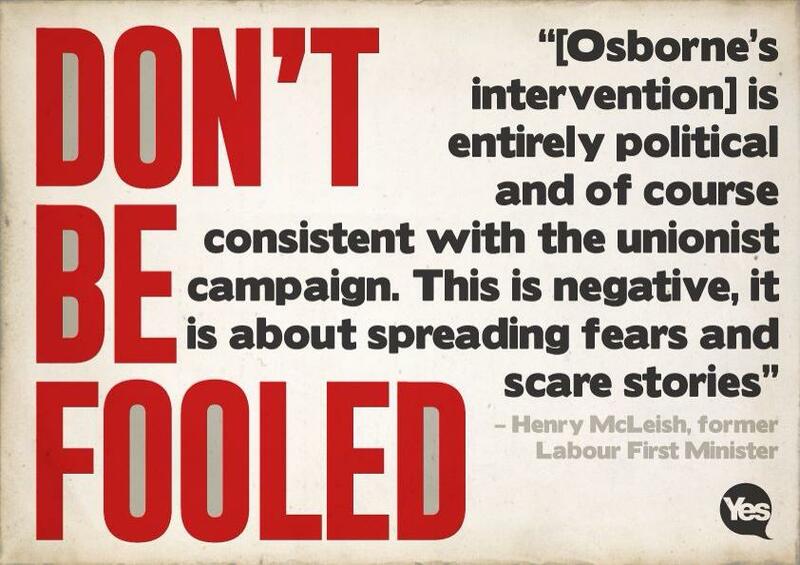 However, that having been said we do obviously understand the effect and purpose of the Chancellor’s propaganda is to stop people voting Yes but in the Scottish Attitude Survey in 2013 conducted on behalf of Sir Tom Hunter only 4 per cent said the currency issue was either first or second on their list of the most important issues for them. 79 per cent of them wanted to keep the pound after independence. In another poll, commissioned by the BBC, the issue of the currency ranked 8th in a list from ten referendum issues. Notably though 71 per cent of people in the REST OF THE UK supported a currency union. So while this issue is very important, the vast majority of Scots do not think it is centre stage as the NO campaign would like to think or hope. Therefore perhaps, like Mr Carney, Mr Osborne’s attempt may have backfired too in that it may have actually helped the Yes camp in securing more support. Sir James Mirrlees who won the Nobel Prize for economics along with many other notable economists put their proposals very concisely and logically backed by their great experience and understanding of their subject in the Fiscal Commission’s First Report (highly recommended, view/download it in http://www.scotland.gov.uk). It is our job now to inform the Scottish voters, lets tell them the truth! Scots Asians for Independence for Yes has a wide range of members affiliated to political parties and individuals aligned to none. They all share one vision – that of an independent Scotland, where we the citizens of Scotland choose how we wish to be governed and to be fully in control of all the powers that all independent nations possess. We have members from Labour for Independence – Sohail Haque, Radical Independence Campaign – Suki Sangha, Jonathan Shafi, Elias Kasha and Aamer Anwar who is non-party. These are just a few of the high profile members who are Scottish and Asian, who are actively working and debating on various platforms from public meetings, tv, radio and taking the message to the doorstep through canvassing and leafleting. We are passionate about the type of future we want, where we succeed and flourish as an independent nation in charge of our own democratic future. We will be publishing their stories over the coming months. By working together we can accomplish our vision of a fairer and more equal Scotland. Tasmina Ahmed-Sheikh will tell an audience at Glasgow’s Langside Halls that she believes her children will have a better life in an independent Scotland and that Scots Asians can play an important role in the campaign (Sunday). The Yes Scotland advisory board member will be joined by Minister for External Affairs and International Development Humza Yousaf to discuss the benefits of independence and the important role to be played by Scots Asians in the referendum debate. With less than a year to go to the 2014 vote, the panel are aiming to convince undecideds and unsettled No’s that decisions made on Scotland’s future, are best made by those who live here and make up our culturally rich communities. Tasmina Ahmed-Sheikh, a former actress and chair of Scottish Women‘s Asian Association said: ‘I believe it’s time to take Scotland’s future into Scotland’s hands so that we can build a Nation which works for all of us. ‘I want women and Scotland’s minority communities, to be front and centre in this debate. And I want to play my part in persuading other women and members of my community, that not only is an independent Scotland possible, it’s the best and only opportunity we have to realise our hopes and our dreams for our families and our country. ‘A country where we value investment in people and investment in society. A country that reaches out to young people, who are interested in the dreams of the future, not the memories of the past. A country where there is provision for the most vulnerable in society. 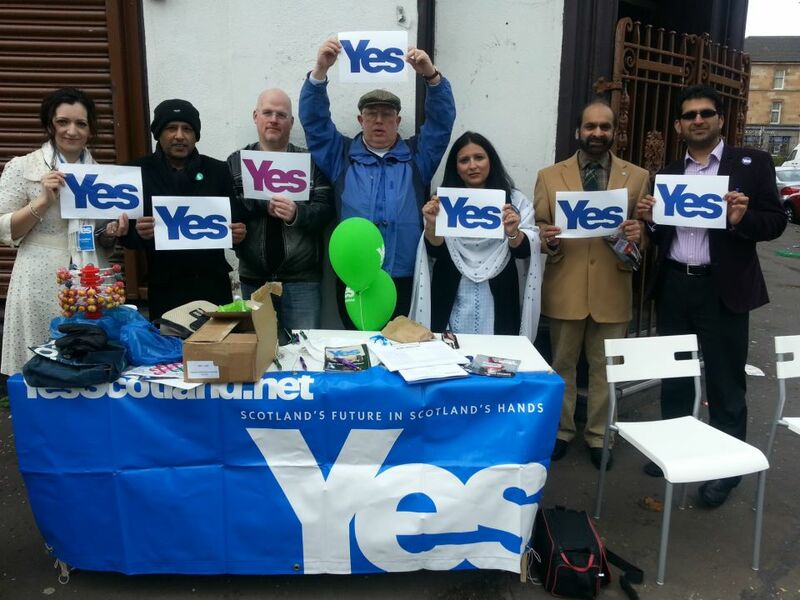 Scots Asians for Independence is one of several sectoral groups set-up to ensure that Scotland’s culturally-rich and talented people can play a role in winning and shaping and independent Scotland. Humza Yousaf, a Glasgow MSP and Scottish Government minister, said: ‘Thousands of people have come from across the world to make Scotland their home, having their voice in the most important discussion our nation has ever had is vital.